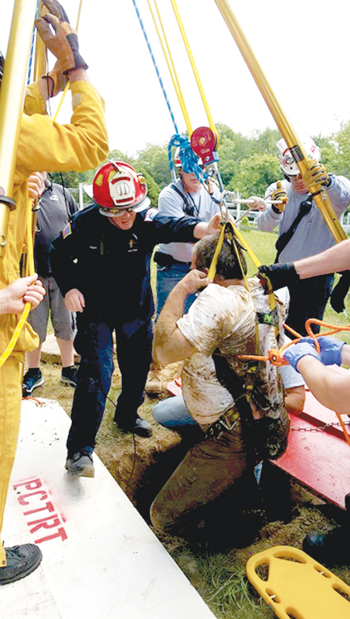 Plympton – Rescuers found themselves in a real stinky situation when they received a call for a man whose friend was trapped in a septic system at 40 Forest Street on Tuesday. The man had fallen inside the tank after what appeared to be a failed attempt to do a self-repair on a title V issue at the home of a friend, said Fire Chief Warren Borsari. “When I arrived the man was inside the tank in about four feet of human waste and liquid” said Borsari. The Plymouth County Technical Rescue Team was immediately requested because of the space the man was wedged in. “There was a two-by-two -foot area that the man had put a step ladder into; when the ladder broke he went down,” said Borsari. He secured the man under his armpits with a rescue rope because of the emission of methane gas inside the septic tank. He said there was a concern the man could have lost consciousness although he did not. The technical team placed boards and supports around the area and set up a hoist to lift the man. The rescue was complete after about half an hour. The man then had to be decontaminated several times with large amounts of water and had his clothes cut off because of the amount of “nasty stuff” that was on his clothing and body, said Borsari. He was taken to the hospital with minor, non-life threatening injuries. The Board of Health was notified and requested to the home. The person attempting the repair was not a licensed plumber.